Check out the official GALAXY S4 Hands-On video below, for a thorough walkthrough and explanation of all the great new features packed into Samsung's cutting-edge next generation handset device. From the S4's stylish hardware design through to its outstanding camera experience and media sharing tools, Samsung's premium smartphone has been designed to bring people closer together and enrich users' everyday lives. The first thing you notice about the GALAXY S4 is that it is really thin, a mere 7.9mm. It's also comfortably light to hold in the palm of your hand, with a strikingly small bezel surrounding its 5-inch Full HD Super AMOLED display and an elegant diamond-pattern rear casing. Plus, even though the S4 screen is larger than the S3, that diminutive bezel means that the body of the phone is actually smaller. The GALAXY S4 is currently available in black or white and not only looks great, but is also incredibly powerful. Its 2600 mAh (milliamp hour) removable battery means that you will be able to do loads more with the S4 before needing to recharge the phone. As for that display, you only have to check out a high definition video on the S4 to appreciate the difference: the colours are vibrant and natural and, with the 441 ppi resolution, web pages are highly defined, making them much more of a pleasure to read. Finally, you can customise the S4's lockscreen for rapid access to the camera or to your favourite apps. And you can design your own lockscreen, selecting your favourite photo and personalised message and tailor the S4's home screen options to meet your own requirements. The GALAXY S4 is equipped with a truly impressive 13-megapixel camera, with an inspiring array of new options to help you create all kinds of fun and innovative shots. For example, Sound & Shot allows you to record up to 9 seconds of audio before or after taking your photo, to remember the moment exactly as it happened. Animated Photo lets the user quickly create fun GIFs to share with their friends and family on social media. And Drama Shot is an incredibly easy way to create very cool time-lapse inspired photos of people or objects on the move. Dual Shot is a particularly cool new camera feature on the S4, which uses both the front and rear cameras simultaneously, letting the user insert a mini framed picture of himself or herself into the main photo – a great way of personalising your pics! While viewing your favourite photos on the S4's vivid screen is great, it is often nice to see your pictures in a beautiful printed album, the old-fashioned way. Which is exactly why designing and ordering a photo album on the S4's fabulous Story Album app is both fun and appealing to amateur mobile snappers. Group Play is a hugely fun feature, exclusive to the Samsung GALAXY S4, allowing users to share music, photos, documents or games to other S4 phones nearby. With music, for example, you can share your favourite tunes, projecting a song onto other S4s in the same room. You can also control which phone acts as left or right speaker to make all sorts of cool effects. Group Play also allows you to easily share pictures with other S4 users in the vicinity. For example, you might want to write a personalised message on a particularly cool photo and immediately share it with S4-toting friends and family members nearby. 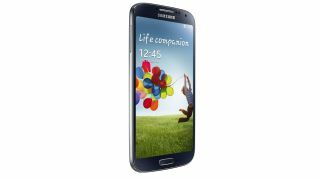 The GALAXY S4 is equipped with a number of gesture and motion control sensors that allow users to control their smartphone in a number of new and convenient ways. For example, with Air Gesture you can interact with your phone without touching it: practical if you are cooking and don't want to get your phone dirty.